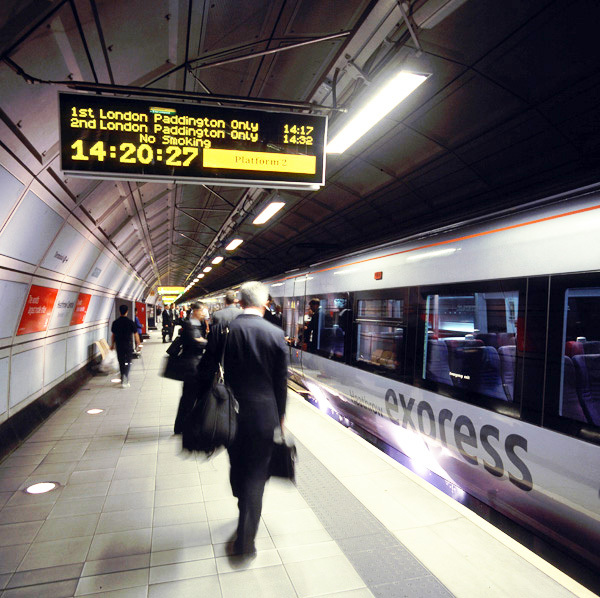 The Heathrow Express is a high-speed rail link giving passengers the fastest journey time of 16 minutes between Heathrow Airport and Paddington Station in Central London. The service was opened in May 1998 and runs from Paddington following the Great Western Main Line for 12 miles where it enters a five mile tunnel near Hayes. From here it continues under the airport to 2 stations, one serving Terminals 1,2 & 3 and a second four miles away beneath Terminal 4. Upon completion of the tunnelling works in early 1997, we were invited by Laing Baily Joint Venture to carry out trial works and offer budgetary advice for the application of a decoration render to the platform tunnel walls at the station at Terminal 4. Flexcrete Ltd had previously designed a decorative render, Monolevel MF, for application on the Jubilee Line. At Terminal 4 this was modified to match the decorative precast GRC wall panels by incorporating a blend of selected micas from international sources producing a highly striking sparkle effect, quite unlike the traditional drab finishes associated with protective renders. A standard of finish was established during site trials following which we negotiated the subcontract for preparation and application of the render to the curved concrete walls to the platforms, walkways and concourses. It was important to give full access to the curved walls for the tradesmen to apply the render. This was achieved from specially designed multi decked mobile scaffold platforms with wheels on both the platform and track. Initially surface laitance was removed from the concrete by strictly controlled wet blasting. Working between the cast in V-joints and for the full circumference of each platform wall the 2 to 3mm thick render was then applied by hand in 2 or 3 passes and finished with a damp sponge to fully reveal the translucent mica inclusions. This process was repeated in the passenger cross tunnels and concourse areas. Dummy joints were introduced to give a continuous finish matching the adjacent newly installed decorative GRC panels. Over 8,500m² of Monolevel was applied over a 6-month period with a team of up to 10 skilled tradesmen producing the aesthetically pleasing finish required.